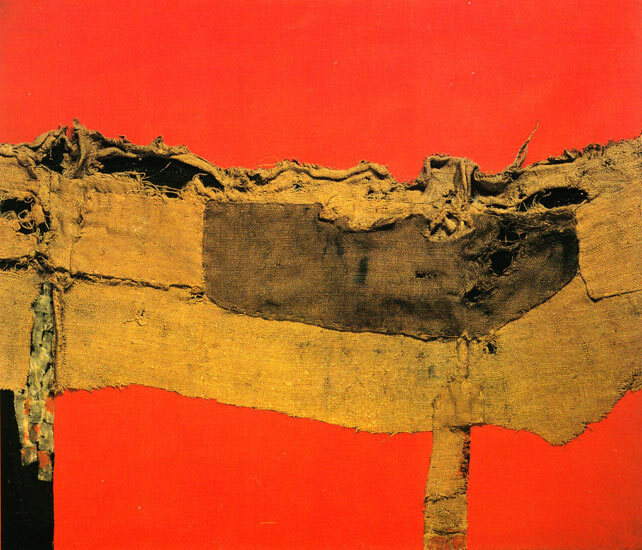 This entry was posted on January 18, 2012 at 12:06 am and is filed under Culture with tags 20th century, alberto burri, artists, estorick, exhibitions, footballer, form and matter, islington, italian, london, painters, sacking and red, second world war, umbria, ymca. You can follow any responses to this entry through the RSS 2.0 feed. You can leave a response, or trackback from your own site. Burri looks more and more interesting to me, in what I suppose is my old age, because early on, as a young New York homeboy art-c chauvinist I could reject Europeans, one by one, if necessary: You name it, I’ll disqualify it. Ironically, knowing that he actually started painting in Texas might have helped because that would have put him in the magnetic field of Rauschenberg, from Port Arthur, a ‘naturalised’ New Yorker. Anyway, what interests me now in AB is how close he comes to ‘crashing’ or even trashing painting into sad-sack ‘Arte Povera’ but the result, as rough and even close to trash as it comes to being — or rather being ‘out of’ — is not debased, not cynical. If anything, it carries the glory of painting into inglorious times. I was going to respond to Robin Gosnall’s previous post about photography, but hesitated, tripping over what one is now ‘supposed to’ say, about mediation, blah, blah; blah, before expressing any aesthetic response to a work of that art, should anybody get that far; but here and now, with Burri in painting, I can simply thank him for provoking these thoughts.